For some reason I seem to be the odd one out when it comes to stuffed mushrooms. 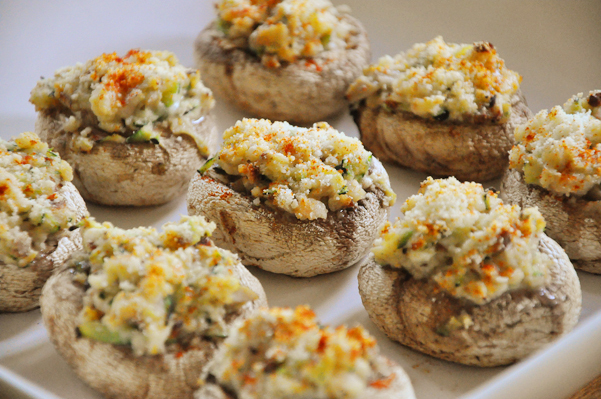 Everyone loves stuffed mushrooms, have you ever served them at a dinner party? Hands down, the first things to go. Always. Me on the other hand, I just can’t seem to get into stuffed mushrooms. Don’t get me wrong, I love mushrooms, roasted or in a quinoa pilaf or even in an omelet, mushrooms are rather hearty, and succulent. Way back in the early days of Living Lou, I posted a recipe for stuffed mushrooms. While both of these recipes have the same base of shrimp, they yield pretty different results. The first recipe is a lot richer than this lighter version I’m sharing today, so I’ll leave it to you readers, which do you prefer? Wash and grate zucchini, allowing zucchini to drain for 5-10 minutes. Meanwhile, wash and remove stems from mushrooms, set aside caps and 5 stems. Roughly chop the stems. In a large skillet heat olive oil over medium heat. Add zucchini and mushrooms, cook for 2-4 minutes, stirring occasionally. Turn off the heat and add shrimp, bread crumbs, cream cheese and cheddar cheese. Stirring until the cheeses melt. Using a teaspoon, scoop the mixture into each mushroom cap, filling just passed the top. Sprinkle with Parmesan, black pepper and paprika (if using). Repeat for remaining caps. Place the mushroom caps on a lightly grease baking sheet, and bake in the oven for 15-20 minutes. Serve immediately. So, are you among the people who call stuffed mushrooms one of their favourites? Or are you like me, and not a fan, but continue to make them often for the ones you love? Yum! Those look awesome. I love stuffed mushrooms and the filling of these sounds delicious!